I’m so excited about this challenge. Why? Because this is my favorite genre to read. 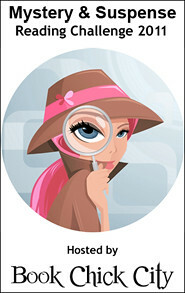 This is how it works: Click the Mystery and Suspense Challenge 2011 button below. Sign up following the instructions on Book Chick City’s site. * Rules: To read TWELVE (12) mystery and suspense novels in 2011 (12 is the minimum but you can read more if you wish! * You don’t have to select your books ahead of time, you can just add them as you go. Also if you do list them upfront you can change them, nothing is set in stone! The books you choose can crossover into other challenges you have on the go. * You can join anytime between now and the later part of next year. * At the beginning of Jan 2011, you will find a link to specific month to add your reviews. There will be a monthly prize too courtesy of the lovely Simon and Schuster – you must be signed up to the challenge and add the link to your review to be entered into the monthly prize draw. To help you figure out and decide, I have updated a sub-genre list – to view this list go HERE. Sign yourself up and see if you can achieve the challenge!! This entry was posted in Reading Challenge. Bookmark the permalink.